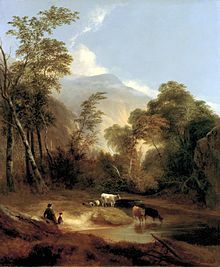 Pastoral Landscape, por Alvan Fisher, 1854. ↑ βουκολικόν. Liddell, Henry George; Scott, Robert; A Greek–English Lexicon no Perseus Project. βουκόλος. Liddell, Henry George; Scott, Robert; A Greek–English Lexicon no Perseus Project.